This is a knit “basket”, found the pattern in a magazine awhile back – you know how it goes, you pull out the page, put it in your to do pile and one day you stumble back across it and realize you actually have some yarn that would be perfect for that project, some yarn you will likely use for nothing else because . . . The bind off on the knitted long edge tightens that up a bit. Am using this for hold the plastic bags I use for the dog’s poop collector. As simple as this is, can actually see a lot of uses for this, or variations. Even for use as a garbage collector in the car! Change the dimensions, make it fancy or plain, a double tab for a wider “basket”. With the right materials, this can also be used as a hanging planter! 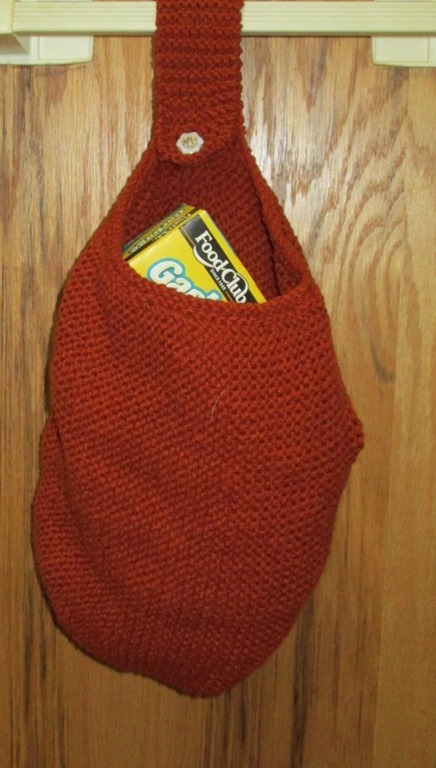 This entry was posted in homesteading, knitting, patterns, prepping, self-reliance, sewing, Uncategorized. Bookmark the permalink.